At Magee Canvas LLC, our goal is to provide you with the highest quality canvas products available. Marine canvas being our area of expertise, we have mobile units servicing Central New York, the Finger Lakes, Rochester, Lake Ontario, and the Central Adirondacks, as well as our facility in Brewerton, NY. If you are looking for Quality and Service, look no further, you've come to the right place. In 1959, Geordie Magee Sr. opened up a small canvas shop in the basement of his home. Customers would bring boats to his location and business was going well. The only problem: he was only getting the boats people could trailer. His idea: put our shop in a trailer and go to the marina! From this idea came the creation of the mobile canvas trailer. 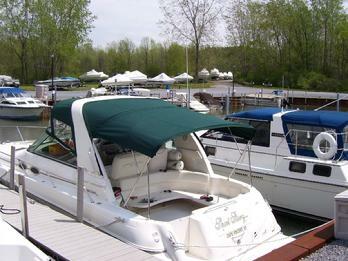 In 1966, he moved his business to its present location with mobile units servicing marinas in the Upstate New York Area.